Lamborghini’s new Huracan supercar has been laced with the latest in hybrid carbonfibre and aluminium construction to make it a hi-tech and very welcome replacement for the decade-old Gallardo. With the likes of Ferrari and McLaren running the higher echelons of the supercar class, Lamborghini has always been lagging behind in its rivals’ wake, but the new Huracan certainly looks to have the right ingredients to knock them off their perch with a mix of technology and brute force. Sitting in the middle of the Huracan is a 5.2-litre 602bhp V10 that can accomplish a 0-62mph time of 3.2sec – half a second faster than its predecessor – all the way to a top speed of over 200mph. Power is driven through a brand new design of Lamborghini’s seven-speed dual-clutch gearbox that replaces the Gallardo’s often criticised E-Gear system. Interestingly enough, 75 per cent of the Huracan’s 413lb ft of torque can be utilised at just 1000rpm which is incredible for a naturally aspirated engine. Meanwhile, work to make the car’s engine more efficient sees economy rise to 22.6mpg from 19.2mpg and the Huracan emits 290g/km of CO2 compared to the Gallardo’s 351g/km. 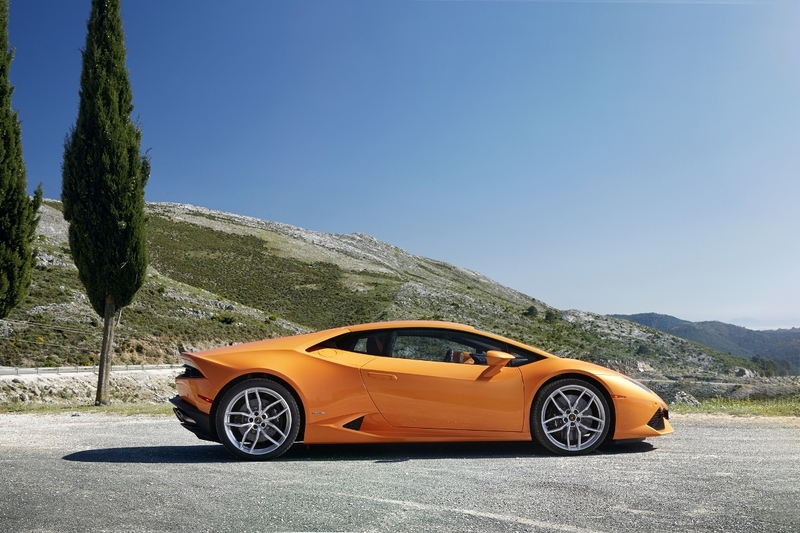 In regards to the Huracan’s structure, Lamborghini has managed to make the car 50 per cent stiffer and 10 per cent lighter than the Gallardo, thanks to Audi engineers creating a carbonfibre moulding that makes up the rear firewall and centre tunnel. This is glued and riveted to the rest of the car’s structure which is made entirely from aluminium, including the front and rear subframes, front bulkhead, suspension components and many more components of the Huracan’s skin. With the bulkhead and centre tunnel moulded in one piece, this backbone of the Huracan takes just 30 minutes to complete and is constructed to a competitive price. Inside is a high quality interior graced with instruments from Audi, including a configurable TFT instrument panel for audio and sat nav, among other facilities. Elsewhere, Nappa leather and Alcantara trim and upholstery create a luxury feel to the cabin that can compete with its rivals’. Chassis and steering characteristics can be altered through what is called the Anima which can be found on the steering wheel. It can offer variable ratio steering that changes the amount of wheel movement depending on the chassis setup and speed of the car. Meanwhile, the Huracan’s 4×4 drivetrain is electrically controlled and is split 30/70 in favour of the rear wheels. Lamborghini claims that 1,000 orders from around the world have been made for the Huracan, but it will need to surpass 14,022 units during its lifespan to beat the company’s best-selling model and its predecessor, the Gallardo. Expect plenty of spin-off models that will no doubt include a Spyder version, along with Superleggera and rear-wheel drive derivatives.